A vinyl fence is tough and will last for a long time. Read more about the benefits of a vinyl fence! When you are weighing the right fencing material for your new fence or replacement fence, there are many options to choose from—classic wood, elegant iron, sturdy chain link, and versatile vinyl. Here are five of the best reasons to choose vinyl for your residential or commercial fence. When compared with traditional wood fencing, vinyl fencing stands out in many ways. Vinyl fencing is about 5 times stronger than wood fencing, so it will do a better job of protecting your home and standing strong during severe weather events. Vinyl fences also don’t suffer from the same issues that wood fences do, like being prone to rotting and attracting pests. Vinyl fencing has incredibly easy maintenance, as there is almost nothing you need to do to keep your vinyl fence looking great. Warm water and vinyl fence-friendly soap will do a great job of keeping your fence tidy and clean. Vinyl fencing does not change color or fade over time, so you don’t need to worry about repainting or restaining it. You also don’t need to worry about any rust. Vinyl fencing is non-toxic, so it makes a wonderful choice for people with children or pets that will be outside. Vinyl can also be recycled due to its lack of toxicity, so you can feel great about your choice and its impact on the environment. Some types of fencing can be very pricey, but vinyl fencing is not one of them. Vinyl fences are less expensive to install, purchase, and to maintain. 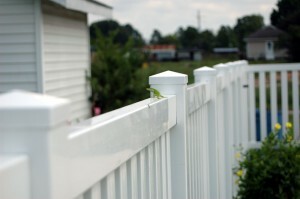 Vinyl fences also typically do not require repairs, repainting, or re-staining. Vinyl fencing is one of the easiest types of fencing to install, so the entire process with Hercules Fence Northern Virginia will be a breeze. In the rare event that your vinyl fence is damaged or needs replacement, the process will also be simple and less complicated than other types of fencing. This entry was posted on Friday, November 11th, 2016 at 8:41 pm. Both comments and pings are currently closed.